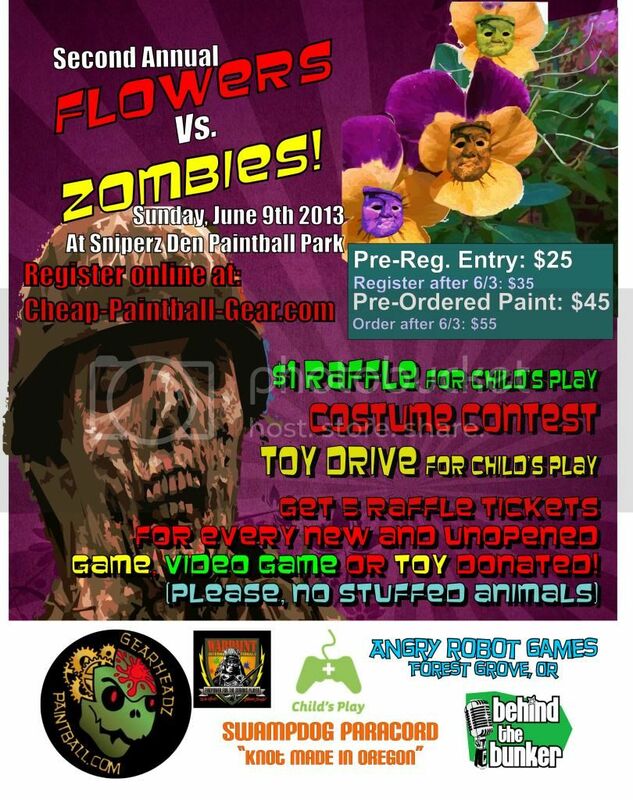 Come back to SniperzDen in June for Flowers Vs. Zombies! This game is based on the popular video game, Plants vs. Zombies. Along with the paintball game we are holding a Toy Drive and $1 Raffle to benefit Child's Play Charity. Toy Drive: Child's Play Charity provides games, video games and toys to children in hospitals. All donations must be in new condition in original packaging. Please, no stuffed animals. Raffle: You may purchase raffle tickets at the event for $1 per ticket. Raffle prizes are being provided by our sponsors. ... and thank you to Behind the Bunker for sharing our poster on the web! Last edited by GHPBwoman; 04-18-2013 at 07:02 PM. Reason: Forgot a sponsor!